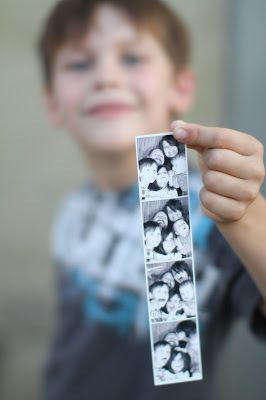 ^^ The kids wanted their own turn at the photo booth. I compromised by letting them each do two. I wasn't sure how the swap mid photos would go, but it totally worked. I love that they both decided to ham it up for the camera. ^^ The Lowes kid activity is always one of my favorites. It gives the kids something fun to do that is totally and completely free…and free at the fair is hard to come by. ^^ We let the kids choose two activities. They could have done different things from each other, but they chose to ride the merry-go-round and do these blow up balls. The past few years we've made a habit of going to the fair. I didn't go to the fair much growing up. At least that I can recall. I can remember going once or twice, but that was it. After we moved home from Scotland, we have hit up the fair pretty much every year. And, I have to admit, my expectations this year were rather low and this was the best year yet! There was not a meltdown or tantrum in sight. And, what was supposed to be an incredibly hot day, seemed to cool down enough in the evening to make it totally bearable. Also, I thought I would be in food hell, given I am in whole30 and being around all the fair food, but I was totally fine. After getting into the fair, we walked around. I wanted the kids to survey the scene before making a decision on what activities we wanted to do. 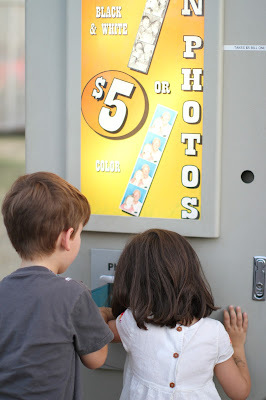 That's when I spotted the photo booths and we hit them up. It's become a bit of my thing to squeeze us all in a photo booth when I see one. Photo booths are kind of my favorite thing ever, so yeah. I love how Callum seemed to not have a clue what was going on in the pictures. And I love even more that the big kids are getting all into the photo booth love now too. Then the kids wanted a treat and ended up splitting an icee. After that, they did some painting at the Lowes tent. Then they went on the merry-go-round and went in those ball things. After that, we went into the baby care center (totally awesome, by the way…it's air conditioned, has a bunch of toys and huge leather couches to sit on) to feed Callum. The kids played for a while in there before we finally convinced them to leave. By that point, it was getting pretty late, so we moseyed on out on the fair. Callum fell asleep on the walk to the car…I swear the ergo has sleepy dust powers for him. Put the hood on and walk around and he is out in minutes. But, back to the fair. It was a really good year at the fair. 4 & 6 are good ages. Really good ages.